As Senior Research Curator (History of Collecting) at the National Gallery, London, Dr Susanna Avery-Quash researches the National Gallery’s painting collection and has curatorial responsibility for the 19th-century items in the History Collection. She studies the history of private and public art collections, especially the National Gallery; the trends in artistic taste for various periods; and the evolution of the art market. In recent years her research has concentrated on Sir Charles Eastlake, first Director of the National Gallery. On this topic her publications include a two-volume annotated edition of The Travel Notebooks of Charles Eastlake (Walpole Society, 2011); and a co-authored biography with Prof. Julie Sheldon, Art for the Nation: The Eastlakes and the Victorian Art World (London, 2011). She has curated two exhibitions about Eastlake: one at the National Gallery in 2011, the other at Eastlake’s birthplace, Plymouth, in 2012. She has written articles on Eastlake’s reaction to the Pre-Raphaelite Brotherhood, on his private art library, his private art collection, as well as on an album of drawings by Lady Eastlake. She has also written chapters on the reception at the National Gallery of the work of Titian in Peter Humfrey’s book on the reception of Titian in Britain (2013), and of Carlo Crivelli for an exhibition catalogue (Brera, Milan, 2009). A particular focus of Dr Avery-Quash’s published work has been on the rise of interest in and collecting of early Italian art. 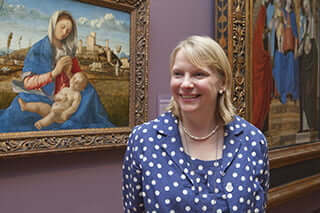 She assisted Dr Dillian Gordon in curating this part of the National Gallery’s collection (2000-2002), was involved with the exhibition Pisanello: Painter to the Renaissance Court (2001), and was responsible for a display focusing on Simone Martini’s Christ Discovered in the Temple (2001). In March 2013 she co-organised an international conference on Discovering the Trecento in the Nineteenth Century. Relevant publications include an introductory essay in D. Gordon, National Gallery Catalogues: The Fifteenth Century Italian Paintings, vol. 1 (London, 2003). In this connection she has also published articles on the role of Anglican clergy and of Prince Albert as collectors of early Italian art. Her interest in early Italian art has informed a third area of her research: early 20th-century British painters who were influenced by Giotto and his contemporaries, notably Stanley Spencer, and various contemporaries at the Slade School of Art. Dr Avery-Quash has helped to develop the National Gallery’s research strategy. She leads its research strand, ‘Buying, Collecting and Display’, for which she has initiated various novel types of collaboration. She is a co-supervisor for a number of doctoral students (part of the Collaborative Doctoral Awards scheme, funded by the AHRC). She played a key role assisting the Director and the Earl of Radnor to open to the public Longford Castle, a country house with important historical links with the National Gallery. At an international level, Dr Avery-Quash has worked often with the Getty Research Institute (GRI), California. Her first collaboration with the GRI (2010-2012) involved her managing a research team to investigate British Art Sales, 1780-1820 which resulted in 67,000 records being added to the renowned Getty Provenance database, as well as a two-day international cross-disciplinary conference at the Gallery (June 2013). She has recently initiated Phase II of this project, which is investigating records from the earlier period, 1680-1780. This will result in a complete dataset of British auction records from the origins of the British art market to the later 19th century, which will sit alongside equivalent data already captured for much of Europe. Dr Avery-Quash did her first degree in modern languages at the University of Cambridge, followed by a diploma at the Courtauld Institute of Art, University of London, and a PhD at Cambridge. She was elected Munby Fellow in Bibliography at the University of Cambridge in 1997. From 2002 she was an Affiliated Lecturer in the University’s History of Art Department. Her association with the National Gallery started in 1998. Before her present post she was an Assistant Curator; from 2006 to 2009 she became the Eastlake Research Fellow and from 2010 to 2014 she was appointed the Research Curator (History of Collecting).